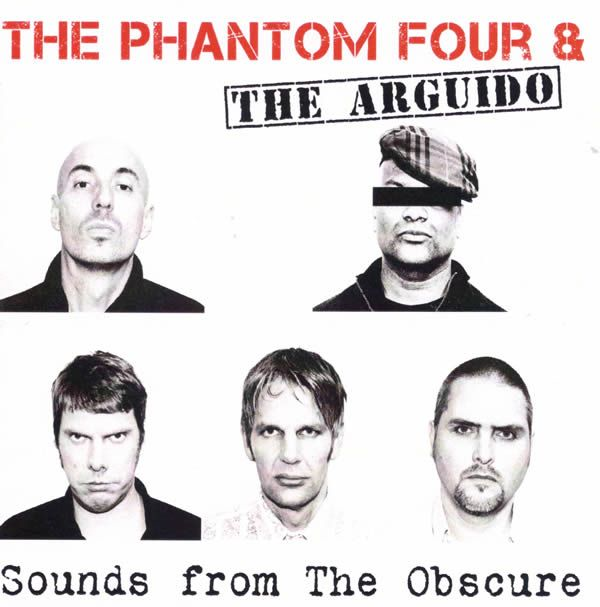 The Phantom Four is the surf band that emerged after Phantom Frank aka Frank Gerritsen's The Treble Spankers ended due to a stubborn injury. They invited Patrick Tilon aka Rudeboy, who we all know from Urban Dance Squad, to see one of their live shows. He was very impressed and they decided to hook up for some songs. The live gigs included Rudeboy as guest singer more and more and now there's a full album. Even better there's one with Rudeboy, or The Arguido as he calls himself here. Even better it's a double CD! 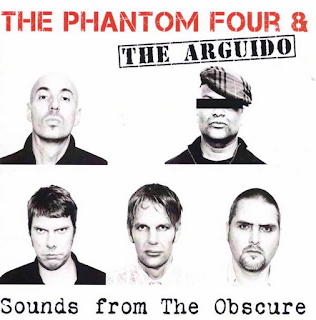 One featuring The Arguido, 'Sounds From The Obscure' and one instrumental one without him, 'Morgana'. And from the first tones of Sounds From The Obscure you find yourself in a movie. Maybe a Tarantino movie, maybe a western. Exciting guitar songs that make you want to move. When Rudeboy kicks in, the songs get more body and sound more aggressive. And it's not hard to imagine the excitement when they experienced this themselves. It's a perfect match. Listen to the fierce 'Settle Down' that grabs you by the throat and won't let go. Or the very catchy and great 'Gun On My Temple' with a playful guitar riff and solid dirty groove. This album has even twelve of those beauties and not a bad one among them. Before you know it the album goes out with its final blow 'The Guestlist'. So the other disc 'Morgana' is just a nice bonus right? Wrong! It's a great album by itself with cheerful surf songs. No wonder Rudeboy was so impressed by this band. Their songs are full of energy, impressive guitar playing and lots of creativity. Original songs like 'Belly Dance #6' which has, not surprisingly, some exotic elements. Or 'A Forest', a surfer's ode to The Cure, and title track 'Morgana' are just simply a feast to listen to. I can only think of one thing that would make them sound even better: a live performance. I haven't got the chance yet, but will make sure I will catch them soon. Make sure you do too and don't forget to get this album. In the meantime: surf's up! Listen to 'Sounds From The Obscure' on Spotify.